In July 2017, you became the 48th president of the Chartered Insurance Institute of Nigeria, did you see it coming and did you ever dream of assuming the position? Actually, it was not something I planned for when I started my career about 31 years ago, but anywhere I find myself, I always make sure I add value. I’m at the forefront, always ensuring I stay relevant. My plan wasn’t to become the institute’s president when I contested to be on its council about 13 years ago. I just wanted to add value, to make a difference. But seeing this happening, I am happy for the opportunity and the privilege to be able to give back to the industry. As the sixth female president of the institute, what is your vision for the insurance industry in Nigeria? My vision for the industry is to be able to put insurance in the minds of the next generation of professionals in this country. We all know that insurance’s major problem in Nigeria is poor enlightenment, that is, in terms of people getting to know about it. Therefore, the theme of my presidency is, “Repositioning the Nigerian insurance industry through education and enlightenment.” The choice of this theme was informed by the need to strategically confront the greatest challenges facing the industry today, which is the information gap existing between us and the people. As you are aware, there is a great lack of awareness about the importance and benefits of insurance to the well-being and economic prosperity of people. This lack of awareness manifests in poor patronage of insurance products by the public and youths’ unwillingness to choose insurance as a course of study. As an institute, we must continue to take deliberate steps to address these issues with a view to repositioning the profession in the psyche of the people. We must build on the past efforts of our predecessors by engaging the people, who we refer to as our stakeholders, to change the tide in favour of our industry and profession. So, during my time, I want insurance to be in the minds of everybody in this country through enlightenment, advocacy, and engagements with the government and professionals so that we will be able to increase our contribution to the Gross Domestic Product of Nigeria in the next two or three years. How can subscribing to insurance policies contribute to the country’s GDP? When people subscribe to insurance products, more income will be generated. When the sector generates more income, more taxes will be paid to the government, which will lead to increased GDP. Also, if more people are subscribing to insurance products, more employment will be generated by the industry. All these indices will contribute to the growth of the GDP of the country. This means you must be working on getting more people to subscribe to insurance products? Yes, even to the level of the youths because presently, they are not interested. They think insurance is the ‘poor cousin’ of banking, which I don’t believe because insurance is an untapped industry in the country. The potential is huge and because of this, we have a lot of foreign companies coming in now — talking about the Alliances of this world, the ASAs of this world, the Old Mutuals, and so on. There is something they are all seeing, which is why they are coming to Nigeria. I believe by the time the economy picks up, insurance will be the next haven of the Nigerian economy. Many Nigerians don’t perhaps include insurance in their financial plans because they believe in the notion that nothing bad will happen to them “by God’s grace.” How would you convince people with such belief to start taking insurance seriously? Yes, we have a lot of issues with religion in this part of the world. People so much believe in “nothing will happen.” But what if? It’s just like somebody telling you they will not die. They don’t know that death is also part of life. One day, they will die. Life has both its ups and downs. When the downs come, what happens next? You are praying that by God’s grace, there won’t be fire, but what if there is fire? Insurance is about taking control of the uncertainties and it gives you peace of mind and comfort to be able to do other things, that if so-so negative or unplanned event happens, you have succour, that you have someone out there that will support you financially to a large extent. Basically, this is what insurance is all about. It’s just like the cooperative system run by many people, which they can always run to for help in case of emergency. They give you money and in the process make profit. This is the basic principle of insurance. You have just one year as the president of the institute, how are you going to make a huge impact? I have initiated many things since taking up the mantle of leadership. One of the key programmes I have in mind is to set up an insurance department in one or two institutions. We are about signing a Memorandum of Understanding with one of them now. Also, I plan to ensure that the certificate issued by the institute to its members has international recognition and we’ve already opened a discussion with the international body. In few months’ time, we should be able to close the deal. One year is not too small to make an impact. You were the first female Managing Director of Cornerstone Insurance Plc, but you quit the job 10 years ago after serving there for 16 years. Why did you quit such a ‘juicy’ position? I had a plan that when I reached my early 40s, I wouldn’t want to work for anybody anymore. I wanted to do my own thing so as to have more time for the family. So since starting your own company, how has it been? There are challenges, but when you are focussed, dedicated and determined, you will scale through all the hurdles. Looking back, I thank God how far He has helped me. Switching over from receiving salary to paying salary, aren’t you burdened and is it something you would encourage anyone to do? I’m a very passionate person. If I believe in anything, I put in everything to make it work. In fact, I do tell people that since I started here, it’s as if I’m not working because when I was on the other side, I put in so much. Then, sometimes I had to work late into the night. But starting this company, I’m not burdened because once you are used to hard work, you don’t believe that there is a challenge you can’t overcome. Does that mean you are more relieved now? I have a lot of relief because I don’t have to deal with office politics and boardroom politics. I do my own thing. Though I have directors here also, it’s a different ball game when you own the majority shares of the company. I can choose to go to work late or not even go to the office at all. I dictate my speed and, of course, I have enough time for my family, something I never had when I was at the other side. There was a time the Federal Government appointed you as the interim Managing Director of NICON Insurance Plc and thereafter offered to retain you as the substantive MD/CEO due to your commendable performance, but you declined. Why? I went there to enable the regulator, the National Insurance Commission, to be able to see the books of the company and they brought in KPMG to know the capital adequacy of the company. I was able to finish the assignment and I felt I had done my bit. I didn’t have the intention of staying there from day one. Or probably you didn’t want to work in the public sector? Not really. They gave me an assignment and I delivered, so I had to leave. I wasn’t interested in staying, particularly because I wanted to build my firm and have time for myself. How did your upbringing contribute to your success? My late parents believed so much in God. They were Christians and they believed so much in the efficacy of prayer. Growing up in that environment, it made me believe that with hard work and prayer, there is nothing I cannot achieve. This really helped me and made me become who I am today. I believe so much in the grace and power of God. Who do you believe contributed most to your success in life? First, it’s God Almighty. 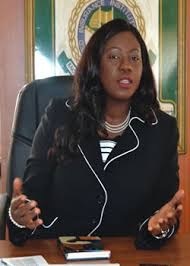 Then, my late husband [Prince Abiodun, 43rd President of the Institute of Chartered Accountants of Nigeria]. He assisted me a great deal. I will be emotional if I start talking about him right now. I lost him five years ago. He was my inspiration, strength and pathfinder in the business world. What challenged you most while climbing the corporate ladder? I realised that as a female, I had to do three or four times what my male counterparts were doing for me to get recognised. Even before I became the Managing Director of Cornerstone Insurance Plc, at a point, a male was brought in because they thought I couldn’t do the job. Unfortunately, the person didn’t deliver and when I was brought in, within two years, I turned the whole place around. So the challenge I faced most was that people rarely believed in me as a woman. People sometimes think women won’t be able to deliver. It’s a major challenge and as a female, you have to do a lot for you to be recognised and given the opportunity to express yourself. I must say it’s tough for women. Sometimes when I was in the office and my child was sick, I would have to quickly rush to the hospital and return to the office again. Sometimes I wouldn’t tell them my child was sick because by the time you started saying ‘my child is sick’ every now and then, they would just write you off. So, women have to do much more than men, which is even one of the reasons I thought I had to quit someday or else so many things would suffer. As a woman, you have a home to run apart from work, meaning you have to work much more than a man. Discrimination against women in the workplace has been an issue for a long time globally, why is this so? It’s because some people don’t realise women have homes to run and that if they don’t have peace at home, they can’t deliver at work. If you don’t have a settled home as a woman, you can’t just perform. But if you have peace at home, you will grow in your profession. In fact, most times as a woman, you have to pay 70 per cent of your attention to your home to be successful at work. How would you then want the society to treat women in the workplace? I think it’s important for women at the top to form a sort of non-profit organisation and start campaigning for this. We should have a voice. We need to advocate for women, to be given the chance to perform. In the instance I cited while working at Cornerstone Insurance Plc, if the man they brought hadn’t failed, I don’t think they would have given me the opportunity to perform. Did you feel intimidated by men while climbing the corporate ladder? No. I never experienced that, maybe because I have a strong personality. But apart from my strong personality, my late husband also helped me a lot. Sometimes when I was going for board meetings, he would tell me, ‘See, those men don’t have two heads. They have only one. If they give you fire, give them back. Don’t let them intimidate you.’ So when you have a husband who is strongly behind you, you will be able to achieve many things. That is why I tell young ladies to marry right. I do tell them never to marry for money. If a lady has a man who has vision, loves her and fears God, she is made because every other thing will come; money will come, peace will come and she will be successful. When she has peace and happiness at home, once she gets out there, she will achieve great things and her husband too will be successful. If you were asked to give women like you just one strategy for being successful and maintaining work-life balance, what would it be? Pay more attention to your home than to your job. The job will always be there. And if perhaps you lose it, your family will always be there for you. This has always been my principle and I have made many sacrificial decisions because of my home. If you stabilise your home, your work will stabilise. I know many families that after their homes crashed, they started failing. Which aspect of boardroom politics pisses you off most and why? Dishonesty among some people. They tell you one thing but do the other. They are not straightforward. I also get pissed off by directors who focus more on their personal gains. They want more than anyone else. It was from my late mother and it is the advice I also give people every day. My mother died 20 years ago, but I can’t forget her advice. Her advice was, “It is what you have in your hands that belongs to you.” The meaning is that you must trust in your ability — in what you can do or what you can achieve. Don’t rely on what others have. My mother’s advice made me to work harder. It made me know that I have power to do all things if I believe I can. It made me to be more focussed and that even if I marry a billionaire, his money is not mine, I have to work hard to get mine. It is what I have that actually belongs to me and I should be proud of it. The advice encouraged me to be contented with what I have and not envy others based on the type of cars they are driving or whatever they own. The advice has lots of interpretation and that is why it is the greatest piece of advice I’ve ever received. It has really helped me to be successful in life. That would be starting a business from the scratch. You know it’s a big risk. Cornerstone Insurance Plc was built from ground zero by some people and I. Thereafter, when I quit Cornerstone, I built my own company with nothing. I think everything is about being focussed and knowing what you want. If there is no determination and planning, one will achieve little or nothing. I started this firm from my house 10 years ago. After one year and made some money, that was when I rented an office space. One would think you must have made so much money while being the CEO of Cornerstone Insurance Plc, which was why you were able to start your company. Where was the money? Sometimes you don’t really need money to start a company. If you can sell your idea to people, they will assist you. If they know you have the skill and experience, you don’t really need money to start, which is where having a network comes in because you must connect. For instance, I have been on the council of Institute of Directors for 12 years and I have always been on several committees. Through this, I’ve run into so many people, some of whom have helped me somehow in this company. I was also at the Lagos Business School at some point in time, where I belonged to a group. In the church, I also belong to groups. I always ensure I remain relevant by contributing to wherever I find myself. I must add value. Networking is key. When people know you and know what you can do, they will believe in you and opportunities will come your way. You can’t just sit down there and think people will find you out. Anywhere you are, add value, go beyond the call of duty. Who are the people you look up to as role models right now? Mrs. Eniola Fadayomi [Principal Partner, Eniola Fadayomi & Co.] and Chief (Mrs.) Nike Akande [President, Lagos Chamber of Commerce and Industry]. I swim a lot, at least three times a week. I also go to the spa. I used to play golf many years ago but I don’t have much time for it again. I also travel a lot to refresh. Hawaii in the United States. I love its weather and scenery. I have visited the place quite a couple of times. Which is your favourite Nigerian city? Abuja. Whenever I travel there, I relax more. I can hide there because I don’t know many people there. Apart from insurance, what are your other passions? I love humanitarian work, that is, running charitable efforts. I also love doing God’s work. Who is your favourite Nigerian artiste? Frank Edwards. His songs touch my heart anytime I listen to them. His grass-to-grace story which went viral recently really touched my heart. What is the first thing you do when you wake up every day? I observe morning devotion by praying to God. Which type of books do you read? I recently read ‘Steve Jobs’ [by Walter Isaacson]. I read successful people’s biographies. I also read books on management. Education is continuous and you have to keep on learning to be successful. Jack Welch, the former Chief Executive Officer of General Electric. I have lots of his books. What is it that you can’t forgive? Forgiveness is good for the soul. It keeps your heart relieved. Hence, I don’t think there’s an offence that I can’t forgive people. It might not be easy, but with time, we should all be able to reach that stage. This is one area where I am also still working on and trusting God for help. When I have to repeat something over and over again. I’m working on being very patient with people. When I see people with health issues because without health, you can’t do anything. Looking back, tell us one singular decision you took that made you who you are today. Giving my life to Jesus Christ. Having spent over 30 years in the insurance sector in Nigeria, what trends do you believe will shape the industry in the coming years? Like I said earlier, a lot of foreign companies are coming into this market and I am sure this will definitely change the face of insurance in the country because they are bringing their technology, new platforms, new structures and new modes of service delivery. I see local insurance businesses partnering with their foreign counterparts to forge ahead. With a lot of hard work and by the grace of God, I see it among the top 10 insurance brokerage firms in the country in the next five years.